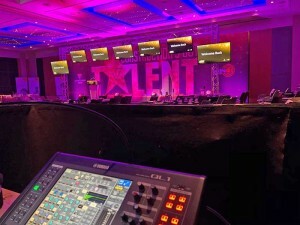 UK – Technical production specialist Central Presentations Ltd. (CPL), working with producers Constructive Communications, delivered full technical Production including a bespoke iPad App for “Construction’s Got Talent”, a team-building / gala dinner conference event with a difference for leading independent construction and property services company, Wilmot Dixon. 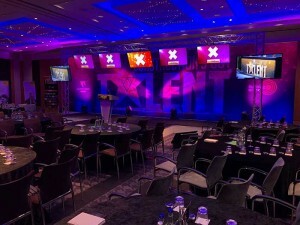 This was staged in the Noble Suite at the Pullman Hotel on Euston Road, London, with tailor-made format partly inspired by TV talent show competitions on a quest to discover the company’s own undiscovered talent, which was interspersed with presentations and speeches. Lee Gruszeckyj led the CPL team who worked with Constructive Communications’ project manager Ken D’Souza. A 10 metre wide stage with free-standing printed graphic wrap set and backdrop including the event's own ‘Got Talent’ logo was installed, complete with small thrust for the competitors and presentations. Meanwhile, at the back of the room, a Judges Stage with its own graphic wrap was built at 800mm high, so just raised above the dinner tables. All the staging was designed and built by CPL specifically for the event. The four judges each had an iPad for which CPL created a custom touch screen interface featuring a big red digital buzzer. Five LED screens were rigged on a scaffolding goal post structure above the stage, each with a judge’s names displayed, and each iPad was linked to its relevant screen. An additional iPad was supplied to the four judges with a golden buzzer surface which they could hit if they wanted to vote an artist straight through to the final. The iPads transmitted a wireless signal to CPL’s d3 media server which output video to the screens and audio to the PA. 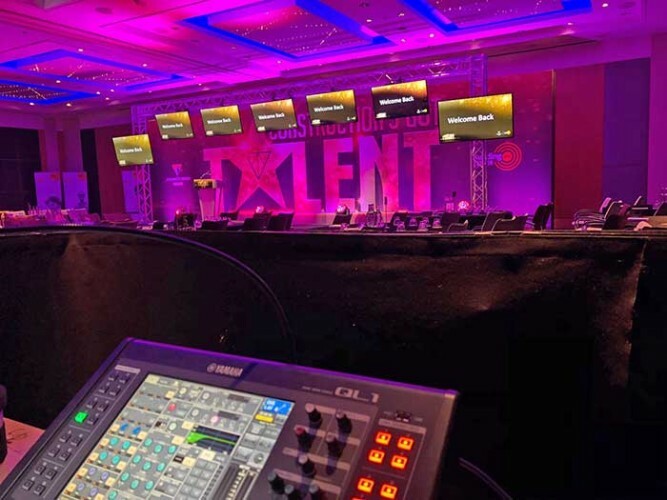 The d3 was programmed with all the event graphics and a host of playback footage which included a series of vibrant talent show pastiche graphics also all created especially for this event. In addition to the four judge’s screens, two 75 inch LED screens were rigged on the uprights of the goal posts to make sure that everyone in the room could clearly see the content. As with the screen's goal post, most of the technical production was ground supported due to restricted roof hanging points and for speed of set up. A careful selection of versatile fixtures were chosen for lighting including ARRI L5-C LED washes and Claypaky a.leda K10s fitted with B-Eye lenses, Martin MAC Aura LED wash moving lights and Philips SL eSTRIP LED battens. These were all hung above the stage and provided all the colour and razzmatazz needed for the performances as well as a nice, crisp white shadow-free white wash for the conference sessions. A few generics were rigged in the roof to light the judges, and everything was controlled via an Avolites Quartz console. Audio was a d&b system, selected for its great sound and compact dimensions, and in this case CPL’s audio team specified a combination of E8 speakers and B4 subs which were rigged in a point source format on stands around the room. Catch-box mics were supplied for Q&A sessions and a full stage mics-and-stands package to deal with the various singers and bands comprising up the bulk of the talent hopefuls. The Ant and Dec style talent show presenters were on DPA headsets mics, and these, plus Shure tie-clips, were utilised by the speakers. A total of ten acts took to the stage over the course of the day, five in the morning and five in the afternoon, with the final staged in the evening during the dinner. This lively and engaging format proving a big hit in energising delegates and ensuring that they had an extremely memorable conference. Lee and the CPL crew started their get-in the previous day. As they could model and prepare so much of the video and graphics content off site and arrive with it pre-loaded and pre-programmed in the d3, this greatly assisted in the flow and speed of the technical set-up on site. A good working knowledge of the event space also helped Lee and the crew to deliver an excellent result, proving that they and Constructive Communications very much have their own talents!